"The Contrarian" - A quartet of king penguins pause to contemplate which direction to walk as they explore the coastline at sunrise. Over the past few weeks I was on an expedition for my Stanford Earth project to a place I have dreamed of going since penguins became my favorite animal when I was 3 years old. I had the incredible privilege to visit the sub-Antarctic isle of South Georgia - home to more than 1,000,000 king penguins - alongside several of my photography idols and mentors. I cannot say thank you enough to Tom Mangelsen, Frans Lanting, Art Wolfe, Justin Black, Sue Cedarholm, Chris Eckstrom, Yuri Choufour, and the expedition team that made this dream a reality. Keep scrolling for images and stories from the expedition! When I told people I was going to South Georgia, I got a lot of furrowed brows thinking I was visiting the southern US state. In reality, a very different expedition was on the horizon. South Georgia is a sub-antarctic isle located over 1000 miles south-east of South America and is home to one of the greatest concentrations of wildlife on earth. Reaching South Georgia is no simple task. After more than two full days of air travel, we reached the Falkland islands where we embarked on a 3 day crossing of the world's most volatile seas. Our first views as we finally approached were giant icebergs, broken from Antarctica itself, drifting in the windswept waves beyond the rocky island in the distance. The mountainous coastline, which looked like a piece of the Southern Andes lost at sea, gave little hint to the spectacle of wildlife that we would encounter onshore. Though the outward appearance of South Georgia gives an aura of rugged inhospitality, few places on earth harbor the scale of life that congregates on the beaches of the remote island in the Southern Ocean. King penguins, which are among the island’s most visible residents, gather in numbers that seem to defy reality. When we approached the coast of South Georgia, before I set eyes on the colony, I could hear the deafening roar of penguins calling to one another in the distance; more than 500,000 voices echoing across the bay. When the sun rose and the island’s largest colony came into full view, nothing could have prepared me for the spectacle of nature covering the landscape as far as the eye could see. It is in this place, under the shadow of wind blasted mountains and glaciers that King penguins have found an unlikely home. South Georgia is as rugged as a place can come, but nature on such scales does not happen by accident. Two giant petrels surround a sheer wall of a glacial iceberg broken from the Antarctic continent and lost at sea off the coast off of South Georgia. At first, it seems odd that any species would weather the brutal conditions of South Georgia. The cycles of nature that make it a hotspot for wildlife however, are hidden in plain view. Giant tabular icebergs like this one provide an important clue. South Georgia is located along the main current that surrounds the icy continent of Antarctica and though the water is very cold, it is filled with nutrients that are key to life. This life-giving water is often deep at the seafloor because of its cold temperature, but the land mass of South Georgia forces the rich waters upwards where an explosion of life thrives, providing the perfect feast for the penguins and other creatures of the Southern Ocean. "Do you think they can see me?" - King penguins with their silly personalities have always made me smile. This particular adult penguin looked like he was trying to blend into the crowd, not realizing he was in a group of chicks. Most of us imagine “clumsy” penguins above water, but their true home is in the ocean where they gracefully fly through the sea just as other birds do in the air. Coming on land, however, is a necessity to find a partner and raise their fluffy-brown chicks. Conveniently located near the richest waters on earth, the thin strips of flat land between the beaches and glaciated peaks of South Georgia create a convenient home. The parents take turns going out to sea, hunting for weeks on end before returning to the colony to bring food back to the anxiously awaiting non-seaworthy chicks. Through the cacophony of noises, smells, and sights the parents miraculously find their chick and partner from crowds larger than any congregation of life I have ever seen. A King penguin toboggans on his fish-filled belly, scrambling ashore as quickly as possible to avoid being tumbled by an incoming wave. Watching penguins come in and out of the waves is one of the funnest parts of being among a colony. As a group approaches the shore, you can see them riding gracefully inside oncoming waves as they weave through the water. Sadly, the gracefulness ends there (luckily penguins are surprisingly resilient)... When the wave breaks on the sand the penguins slap into the ground and attempt to scramble to their feet by kicking and flapping their flippers, splashing water on their similarly disoriented neighbors. Many eventually get to their feet and begin “running” only to trip and fall face-first into the sand. Though not every penguin makes it ashore the first try, each determined member of the group eventually makes it safely back to the colony where their family hungrily awaits. The comedic display on the beaches of South Georgia is not reflective of the King penguin’s remarkable agility in the sea. They dive through the water at lightning speed and soar under the sea like a normal bird in the air. While hunting, Kings can dive up to 1000 feet beneath the waves in search of food. A lenticular cloud formation sits like a series of flying saucers above the highest peaks of South Georgia that rise from the wind-whisked seas below. As the ship-clock neared 11PM , one of the expedition crew casually called out on the intercom that there were lenticular clouds on the horizon if anyone was still awake. After a long day of image making onshore while fighting a wicked wind, I had to muster all of my strength to bundle up and get out on deck. Though the promise of lenticular clouds is enough to get any photographer out of bed. Though I have seen lenticular clouds before, I have only seen singular versions of the strange saucer shaped clouds. When I stepped outside to see a rare sky full of lenticular clouds clustered atop one another like a stack of golden pancakes, I froze in disbelief of the beauty. As a wall of mountains in the middle of one of the windiest places on earth, South Georgia the perfect storm for lenticulars. Clouds like these only form when intense winds - which neared hurricane speeds that day - are forced into a standing wave by mountains, leaving otherworldly disks above the highest summits. A king penguin rests peacefully in the sun, keeping one eye open (like a child watching for a glimpse of Santa the night before Christmas - or whatever holiday you celebrate)! King penguins are often mistaken for their slightly larger and more famous siblings, the Emperors. Because Emperors are the biggest species, they often get the most attention, but King penguins have a much more elaborate and vibrant color pattern. Though the two share a similar chest, face, and beak, King penguins have far brighter orange, yellow and sometimes red along with the shimmering silver and black on their backs. The “3 Kings” of South Georgia march together in sync along the beach, headed to join 500,000 of their closest friends gathered at the mountainside. Penguins are not the only animals raising young in South Georgia. A pair of baby elephant seals (also known as “weaners”) seek each other's company on the beaches of South Georgia having been weaned from their mothers. Elephant seals in their weaner phase seem to think anything is their mother and if you aren’t paying attention, it is not uncommon to find a group of them crushing your camera bag under their rolls of blubber. The explosion of new life that is growing up on the beaches of South Georgia today is staggering, but not long ago it was the site of one of the most destructive wildlife massacres in history. In the late 1700s commercial seal hunters flocked to the beaches of South Georgia as if they had found gold. Sealing operations for oil and pelts were so intense that the island was nearly wiped clean of its fur seals and elephant seals in a matter of decades. With little left to hunt, the sealing industry moved elsewhere and the fate South Georgia’s seals was finally given back to nature. It has taken more than 200 years to rebound, though it has done so in a manner than gives many hope for the ability to conserve species to recovery - the remote location of South Georgia aiding in the ability for species to recover without negative human influence. A mother Gentoo penguin shares an affectionate moment with her newly hatched chick, keeping it close by and out of the dangers of the wild world beyond. When people came to exploit the seals and whales of South Georgia, they left behind a hidden killer - rats that hitched a ride onboard the ships. On an island primarily inhabited by birds with no mammalian predators and no evolved defense, the introduction of egg and chick hungry rats proved devastating to countless species. Pipits and pintail ducks where the hardest hit species and rats also went after young penguins and penguin eggs, leaving many bird populations on the brink of extinction. Without human intervention, South Georgia’s abundance of life may have easily disappeared. The miraculous and hopeful conservation success story of how South Georgia was saved from this infestation will be continued in the next post! Keep posted for the image tomorrow. The thing that almost wiped out South Georgia’s ecosystem and the thing that saved it arrived on the decks of ships. Without penguin-loving tourism ships bringing visitors to the remote island, rats would have started a wave of extinctions. In 2011 the South Georgia Heritage Trust and Friends of SG embarked on a seemingly impossible task - remove every last rat. If the project were to be a success, not a single rat could remain. Such a large scale island eradication had never been attempted (the previous being only 1/8th the size) and would require significant funding - 13 million dollars to be exact. Funding for a distant territory was not fully forthcoming from the British government, so only private fundraising could save the island. Tourists who had experienced South Georgia on expedition tour ships and the media they brought home was directly responsible for creating a community of people who were passionate to ensure South Georgia would not be forgotten. Racing against the clock of shrinking glaciers (which isolated sections of the island from migrating rats), conservationists worked tirelessly in the toughest conditions on earth to spread rat bait. Now, thanks to people who cared deeply about the island and its inhabitants, the impossible became a reality. South Georgia was declared rat free this spring, giving hope for the challenging future of saving species around the world. “May I have this dance?” - A brave King penguin playfully teases an Antarctic fur seal who was slightly less amused by the shocking turn of events that interrupted his afternoon nap... The goofy penguin danced and ran around the fur seal, facing his fears to play with one of the most dangerous animals on the island. Though the seal was reticent and confused at first, he eventually gave in and joined-in on the penguin’s game. I was laying on my belly photographing the colony from the outside when this curious king walked right up to me and put his flipper out to the side as if to welcome me to his crazy home. Though the gesture was likely trivial, it is so easy to project human qualities onto penguins with their upright stance and tuxedo-like coloring. One of my biggest takeaways from South Georgia is that unlike many places in our anthropocentric world, the wildlife is truly in-charge here. Though Britain claims "ownership" of South Georgia, there is no question that this place - more than any other on earth - belongs to the penguins, seals, albatross, and others that congregate on the beaches and mountains. "Put your best foot forward" - A Gentoo penguin sprints along the shores of the Falkland Islands heading towards a nearby colony. With so much personality and character, I could never get tired of watching penguins. I would often take moments just to sit, watch, and chuckle as they went about their daily lives around me. As my first quarter returning to Stanford begins, I couldn’t think of a more fitting image to display the feeling of being back and “stepping forward” into the school year ahead. The Falklands, which are the nearest developed islands to South Georgia, display a sharp contrast to one another. Rather than a land that is at least symbolically owned by nature itself, many of the natural areas of the Falklands are privately owned by British families that have lived and worked there for generations. With little opportunity for traditional work in the remote section of the southern ocean, the people vitally depend on nature-loving visitors. As a result, landowners have the incentive to ensure the protection of their owned slice of nature. The ecosystem along with the people of the Falklands mutually benefit from a protected natural ecosystem. It is a harmony between man and nature like none other on earth. As the sun slowly set on the island of South Georgia and the ship sailed away, I stood next to the captain to savor every last moment that the magical island was visible above the tumultuous waves on the horizon. Just as I thought it was all over, one last sight - a large tabular iceberg broken from the Antarctic continent - presented itself in the distance. As we approached the sky fell towards darkness, but suddenly the sky illuminated with colors that I would not have believed had I not seen them with my own eyes. The iceberg (that even had a waterfall of turquoise meltwater pouring from its edge) seemed to act like a projector-screen to the atmospheric backdrop. Though I have said it many times before, icebergs are tragic in their beauty. 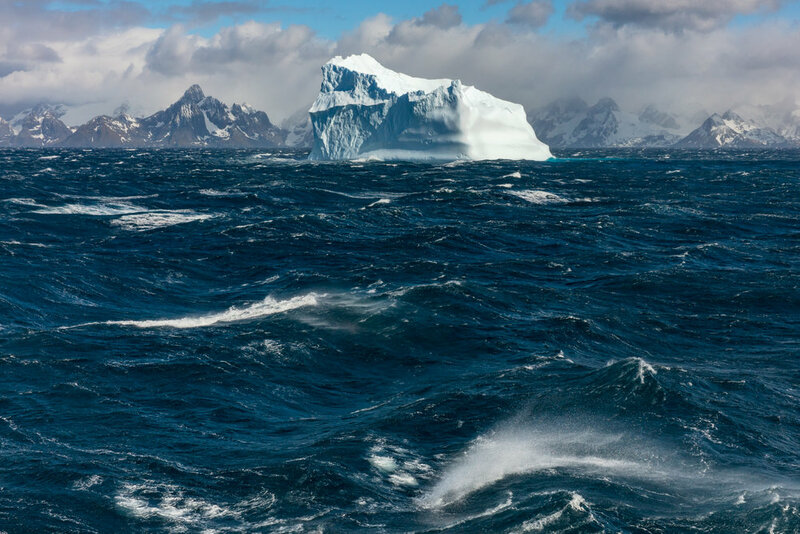 The increase in presence of large tabular icebergs like this one, which likely broke from an increasingly retreating ice sheet, represent an Antarctic system that is proving to be far less stable in the face of warming than was predicted just a few years ago. I often struggle to come to terms with knowing firsthand the magic of things that we stand to lose as humans. As people say, knowledge brings great responsibility. It is precisely that responsibility that motivates me every time I pick up my camera. 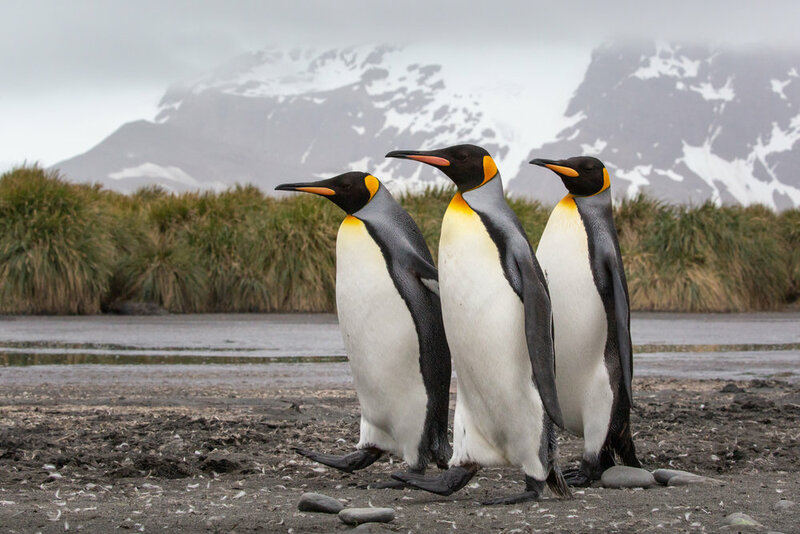 King penguins are among the most charismatic species on the planet, making them an important anchor for conservation in a part of the world that is distant from the lives of most people. Though unfortunate, charismatic species attract human attention more than others and most people do not have the time to care about every animal or landscape. Drawing public support for a charismatic species is a starting point for creating public concern for entire ecosystems without overextending attention. When a species can act as a proxy for a greater ecosystem that may not be not as eye catching to the public, the strategy can draw audiences that would have been indifferent. Creating compassion for full ecosystems often leads to more diverse conservation efforts in the long-term, but attracting the public to a charismatic species in the short-term has the potential to evolve into a more widespread effort. Without King penguins and the media that has made them famous, I believe it is possible that South Georgia's ecosystem would still be in peril. A nesting black-browed albatross tucks its head into its artfully elegant feathers while resting at a colony in the Falkland Islands. These beautiful birds are struggling to stay afloat in battle against the long-line fishing industry which threatens to needlessly sink albatross populations into oblivion. With certain fishing practices, albatross species are attracted to fish bait and get caught in fish nets. By some estimates 100,000 albatross lose their lives to long-line fishing each year, making albatross the most threatened bird family in the world. Albatross are long-lived/slow-maturing birds that pair with a single mate for life. As a result, the death of one or both birds in a pair has a lop-sided impact on future generations. In the South Georgia Maritime Zone, fishing vessels are now regulated by a set of rules that make it possible for coexistence with little to no cost to fisheries. Though South Georgia's regulations have been successful at keeping the birds safe, albatross are incredibly mobile birds that travel thousands of miles across the ocean. Ensuring a future of these spectacular birds means shifting the international industry towards a new mindset of conservation and stewardship. A notoriously blubbery southern elephant seal "weaner" rests on the shores of South Georgia island, looking out towards the vast Southern Ocean. Despite South Georgia's remote and rugged geography, as much as 54% of the world population of southern elephant seals are born on its shores. Come November, the beaches are filled with hundreds of "weaners" who get their nickname from the fact that they have just been weaned from their mothers' milk. Though penguins take the top spot for the silliest creatures in South Georgia, the "weaners" with their clogged noses, rude sound effects, and helplessly fat bodies take a close second. Having just been left by their mothers, it is not uncommon to find yourself surrounded by "weaners" looking hopefully up at you hoping that maybe you too can offer them some milk. With faces like these, it is difficult to imagine that the species was almost hunted to extinction for the oil in their blubber following Captain Cook's account of the island in the 1700s. It was not until 1964 that people enacted a ban on the hunt, allowing elephant seals to slowly recover on the beaches of the Southern isle. Seeing beaches full of healthy elephant seal "weaners" is a hopeful sight that cannot be taken for granted. The many success stories of conservation in South Georgia and the Falklands are diamonds in the rough of today’s planet in peril. These stores give a glimpse into a wild world that once was, but also a world that can be resurrected from the ashes of our human-impacts. For many species and ecosystems all across the globe, no matter how daunting the task may seem, there is always hope for conservation. With a little nudge from people, nature has the power to bounce back in ways that we cannot even imagine. A gentoo penguin extends a flipper, stretching after a long morning of sitting on the nest. Images of giant colonies of king penguins stretching as far of the eye can see often lead to the assumption that all kinds of penguins experience the modern ecological luxury of large and stable populations. Sadly, gentoo penguins do not share the luxury with kings and are among the many species around the world that are fighting an uphill battle for their share of an anthropocentric globe. Fish stocks in the Southern Ocean are increasingly over-exploited to feed the growing human population and keep pace with crazes for health products such as krill oil. When humans are thrown into the mix of the ecosystem without considering the needs of other species, there is no longer enough food to go around and populations begin to collapse as humans crowd the ecosystem out. Gentoos have not experienced a full collapse yet, but their population declines are a canary in the mine that signals towards an entire ecosystem in danger. Measures are being taken to protect the sustainability of harvests in the region, but as long as consumer demand remains high, illegal fishing depletes the seas. Among the most important lessons I have learned from traveling to some of earth's most remote places is this: though penguins, or polar bears, or rhinos may seem worlds away from most of our daily lives, the actions we take have impacts far beyond our field of view. It is a small world and each individual has the power and responsibility to keep that world spinning.